While his official MLB rookie cards were released in a handful of 1993 products, collectors have several Derek Jeter minor league cards to collect. 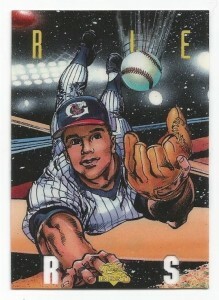 These were issued between 1992 and 1994, before Jeter made his debut with the New York Yankees on May 29th, 1995. 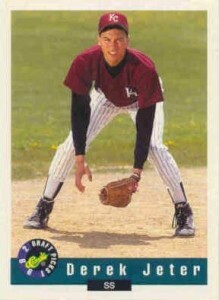 Derek Jeter's professional career began at a time when the hobby was going through its many changes. It was transitioning from the era of junk wax where many products were over-produced to one of manufactured scarcity created by serial numbering and smaller print runs. Derek Jeter collectors can easily collect all eight of his MLB rookie cards. The bigger challenge is acquiring the numerous, pre-rookie cards from his minor league days. Derek Jeter's first autographed cards come from this period. They can be found in 1992 Classic Four Sport, 1992 Front Row Draft Picks, and 1992 Little Sun High School Prospects. 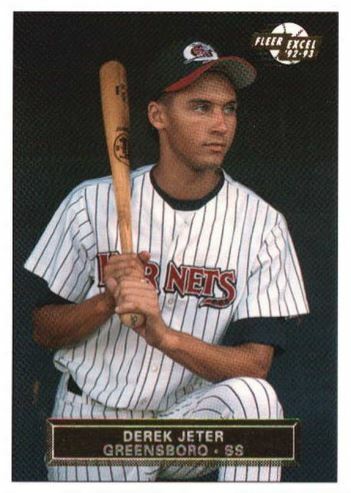 Below is a comprehensive guide and checklist to Derek Jeter minor league baseball cards. 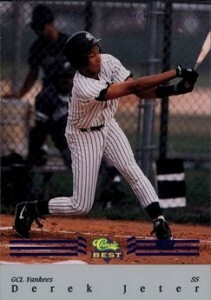 This card showcases Jeter in an action photo at the plate. A Blue Bonus parallel card was also produced and can command significant dollars on the secondary market due to its relatively low population report in high grade. 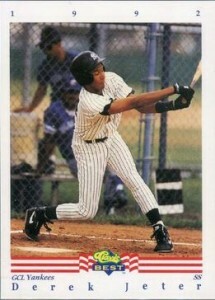 A classic Derek Jeter card, this one has him in a posed photo at shortstop. 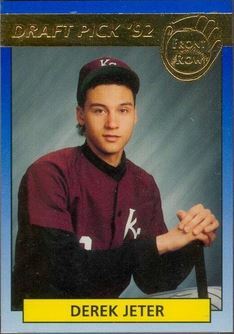 Projected as a top draft pick out of Kalamazoo High School this is one of Jeter's more common pre-rookie cards. The card has a Foil Bonus parallel that creates a bit of a chase. 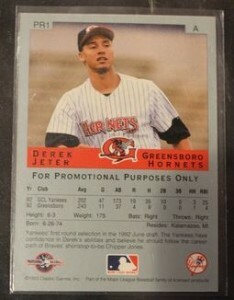 This is one of the most prolific and readily available Derek Jeter minor league cards due to the excessive print run. The unflattering photo pictures Jeter throwing the ball. 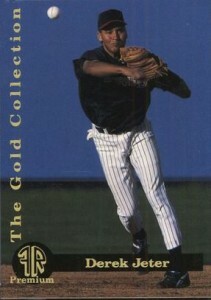 The set also has a Gold parallel that has 9,500 copies and one of the first Derek Jeter autograph cards. 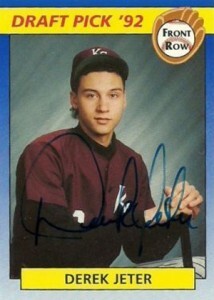 Derek Jeter's first autographed baseball card was produced while he was still in high school. Limited to 1,125 hand-numbered copies, the card is signed in blue ink. 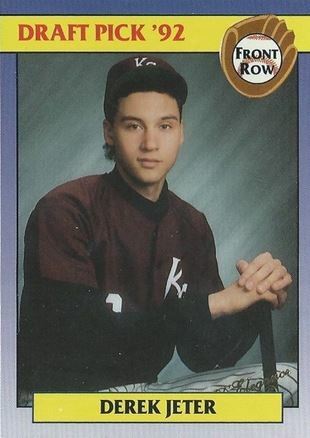 This card mildly resembles a 1990 Topps Baseball card and pictures Jeter in a high school year book like pose in his Kalamazoo High School uniform. The set has two parallel versions: Gold and Silver. The card part of a promo sheet. Additionally, 500 copies of the card came autographed. 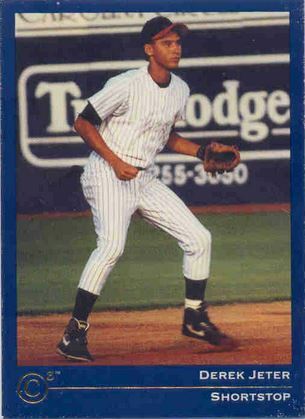 Another top-notch minor league card made by Fleer under the ProCards brand, this is one of the first cards to picture Derek Jeter in New Yankee pinstripes. 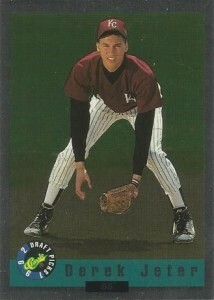 This card came while Jeter was a member of the Gulf Coast Yankees. These are some of the rarest Derek Jeter cards. He actually never attended Little Sun High School. The autographed version of the card is limited to just 250 copies and is signed in black ink. Derek Jeter's first Upper Deck card shows him in a throwing pose, sporting minor league pinstripes. The card is stamped with gold foil designating him as a draft pick. High-grade copies can go for decent money, typically in the $50-$100 range. The dark blue borders of this early Jeter card are very susceptible to edge wear. Gold foil accents the front of the card. The back of the card features a write-up that describes Jeter as a "scout's dream" and "good person." It is interesting to note that the photo on the back of the card is the same one used on his 1992 Classic Four-Sport card. Made by Fleer, this is one of Jeter's better looking minor league cards. Picturing him in a posed shot from the dugout, Jeter eagerly awaits his turn on-deck. 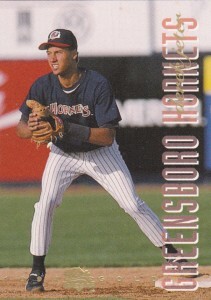 The gold name plate and manufacturer logo add a touch of class to this card of Jeter while he was with the Greensboro Hornets. 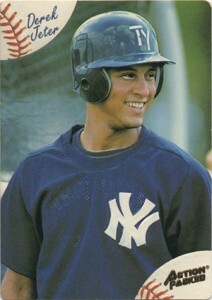 The back of the card features a close-up of a youthful Jeter, whose smiling exuberance for the game has never faded. Another Derek Jeter card manufactured by Fleer under the Excel brand, the card shows Jeter in a posed batting stance in his Greensboro Hornets uniform. He also has a League Leaders subset card on the checklist. Featuring a full bleed, borderless photograph of Derek Jeter on the base path, this is an attractive card card of the young shortstop. 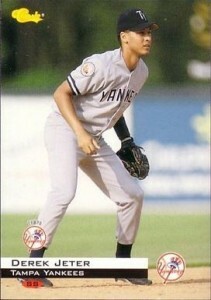 Derek Jeter has a total of four cards in 1993 Classic Best, including an autograph. The base card and the promo card are identical on the front but have very different backs. Side-by-side comparisons can be seen below. The Gold insert has a more dynamic design with gold foil accents. 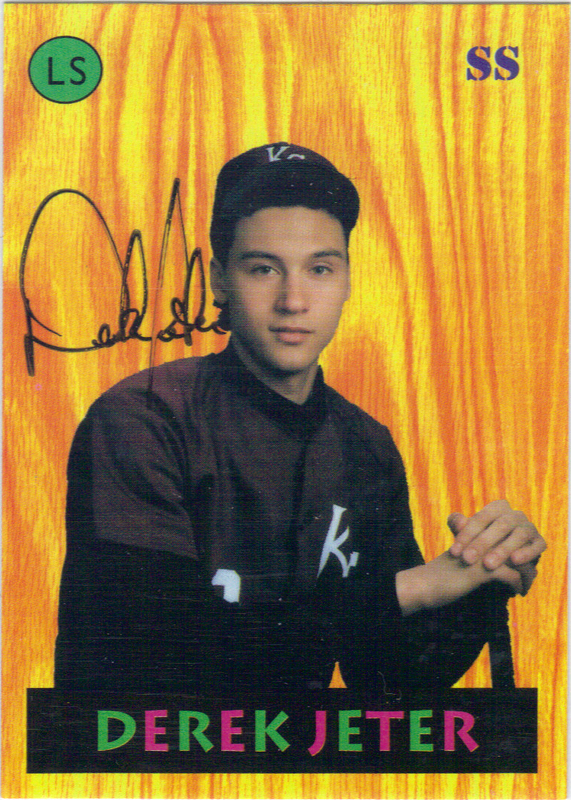 Derek Jeter's 1993 Classic Best Autograph card is hand-numbered to 1,200 copies and is signed in blue Sharpie. This card features premium photography and gold accents. 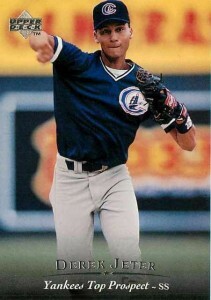 A full-bleed photo of Jeter against a landscape background and deep blue sky make this a visually striking card. 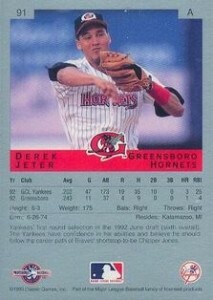 This Derek Jeter card is part of the Greensboro Hornets Team Set. 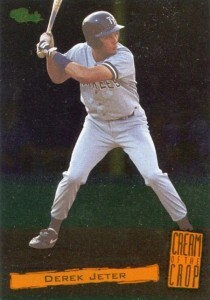 Manufactured by Fleer for ProCards, it shows Jeter in a posed batting stance. 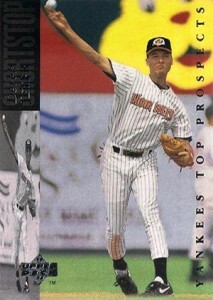 In trademark Action Packed fashion, this is the only Derek Jeter minor league card that's embossed. While certainly a gimmick, it makes the card distinct. Like other Action Packed cards, this set was produced with rounded corners. 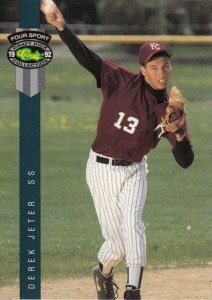 Derek Jeter has four cards in 1994 Classic Best. The base card is straightforward, picturing the shortstop in his Tampa Bay Yankees road uniform. The Cream of the Crop insert has a muted background and stark color contrast. 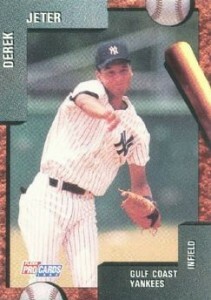 Jeter's image appears to pop off the card. The Illustrated Acetate insert has neat artwork. It's done from a perspective where it looks like he's diving off the card. There's also a Gold insert that has another crisp shot. By now, everyone in the hobby knew Derek Jeter was going to make it to the show at anytime. This card by Upper Deck, which has a design that's very similar to the regular 1994 Upper Deck Baseball set, seems to reflect the fact that he arrived. 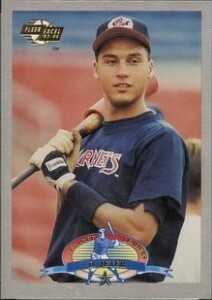 When 1995 rolled around, collectors were more interested in Derek Jeter cards showing him with the Yankees. This particular card, although nice, is probably best suited for completists. 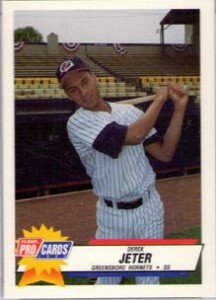 Derek Jeter would continue to have occasional minor league cards produced in 1995, usually as a tribute or promotion for one of his past teams. He also has some fully licensed prospect cards that collectors sometimes treat as rookie cards. You can shop for some of them here. 1992 Derek Jeter Classic Best Blue Bonus #BC22 Graded 7.5 NM Rookie Card RC! 1992 Classic Four Sport Derek Jeter #231 B 9 w 9.5 Mint RC!!! 1993 Derek Jeter, Classic Best Pre Rookie Card, Beckett Graded Near Mint 8.5. 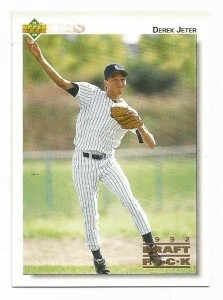 1992 Classic Draft PIcks Foil Derek Jeter #BC6 B 9 w 2 9.5's Very Sharp Card! 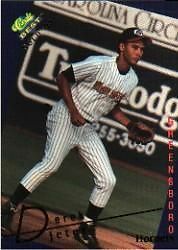 1993 (Six) Box Collection - Derek Jeter Rookie Cards ? Hello. 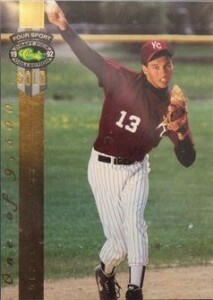 I have a collection of Derek Jeter demo, high school, minor, and rookie cards that number 108 at the moment. I know of 3 cards that I do not have as they are out of my reach financially at this time. 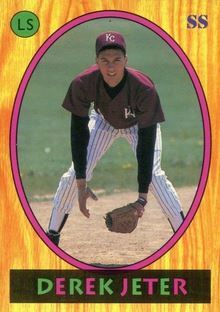 My question is this: Is there a formal list of Jeter cards 92-96 out there that I can obtain so I may compare my collection and see what, if any I have missed? how many jeter little sun cards have been graded psa 10? i have a psa 10 jeter little sun just want to know what the pop is ? 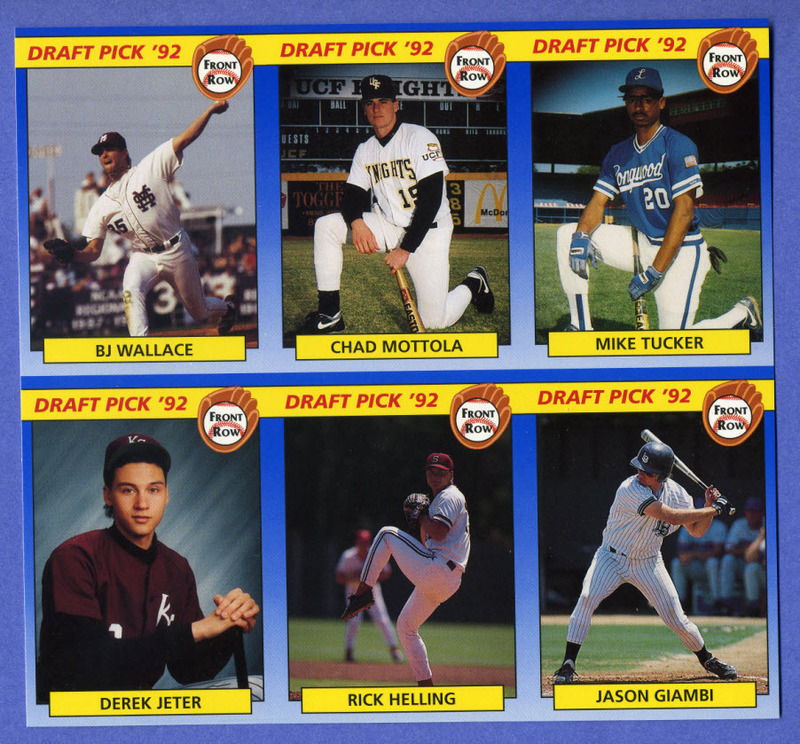 The 1993 Classic Best Greensboro Hornets #1 is missing from the list� Im always on the hunt for Jeter rookies and minor league cards to add to my collection. I thought i would share pics of my favorite piece, that I picked up in an auction recently. Hard to say what it is worth because I don’t have another one to compare it to.. 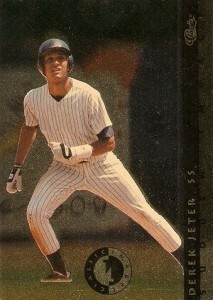 I have over 400 Jeter 92 – 96 Rookie cards. I am looking to sell them off here by the end of the year to clear away for my other collections. In this collection of Jeter’s are two High School Promotional cards. One is a Basketball card – the back has Kalamazoo High School Promotional Card on it…… I have seen only one like it ( it was a blank back card ) the seller was asking $6,500 for it and listed it as super rare. 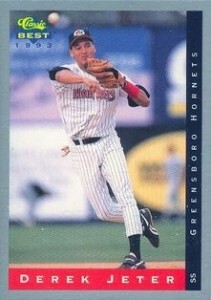 The second card is a Greensboro Hornets Baseball Promo card with the same Promotional Card on the back. Both cards are graded 10 by PCA. I have contacted PSA on these cards and they were very forthcoming with there information. They really do think they are the real deal, but have idea how many are or how much they are worth……. They will continue to do research on them and suggested that I hold on to them as they the other sellers price could be at most, half the book value if they are as rare as they think they are…………. My question is, Has anyone seen these cards? Interested. Are they still for sale? 1992-93 Fleer Excel Minor League Derek Jeter #210 PSA 9 Very Sharp RC!! 1992 Derek Jeter Front Row Draft Pick #55 Card PSA 9 Very Rare Mint RC! !